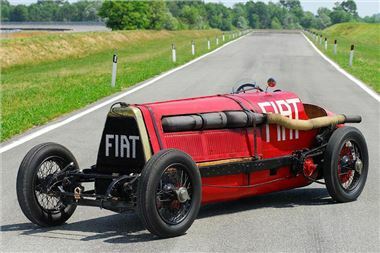 FIAT's legendary Mephistopheles, the colossally powerful, aero-engined giant World land speed record-breaking car from 1923, is to put its pace to good use again this weekend at the Goodwood Festival of Speed. The monster car, built by Sir Ernest Eldridge on the base of a 1908 Fiat SB4 Corsa and powered by a WW1 FIAT A12 aircraft engine (the A-12 Bis), is the only one of its kind in the world, and will be going up the Goodwood Hill twice a day over the Festival of Speed weekend. Part of a group of big racers, it’s in a batch called, ‘Pioneering Giants’ and will also be on display in the Cathedral Paddock. Eldridge modified the car by lengthening the chassis (the wheelbase was lengthened to 11ft 5 1/8thins), using parts derived from a London bus, and adding the aircraft engine converted to deliver 320 HP. On 12 July 1924, Mephistopheles – so called due to the bangs and puffs of smoke that it emitted when capturing the world land speed record – reached the extraordinary figure of 234.97km/h (146.01mph). Since 1969 it has belonged to Fiat’s historical collection, and recently underwent a long and intensive process of restoration.